One of the best things about Android is you can pick the phone with the features you want and there are plenty of choices. Size, weight, battery life, processor type, display type, display size, connectivity, and upgradable storage are just some of the options you have to choose from. In this article I'll explain what some of the differences are and hopefully help you choose a phone that best meets your needs. I'll start by talking about some of the technologies in phones, grouping my thoughts by component. Then I will list some of the new high-end phones available now and expected to be released later this year. I'm not covering phones with pen input, like the Galaxy Note 2, because there are only a few of those to choose from. What are you looking for in a smart phone? I would love to hear your thoughts! There are four areas I want to cover related to the CPU: GPU, core count, die size, and ARM Cortex-A architecture. I'm not going to talk about clock speed because the architecture of the CPU is usually more important and while increasing the clock speed makes the processor faster it also uses more power when comparing similar processors. The GPU, or Graphics Processing Unit, is a major component of the CPU. Though two separate entities the GPU has been integrated into the CPU over the years to save power and space as well as for other reasons probably. The current Snapdragon S4 Plus (Galaxy S3, One X) uses an Adreno 225 GPU which, while very fast, is similar in design to last years Adreno 220 in the Snapdragon S3 CPU's. The Snapdragon S4 Pro CPU's will use an Adreno 320 GPU which is a new design and is supposed to be 3-4 times faster than the 225. 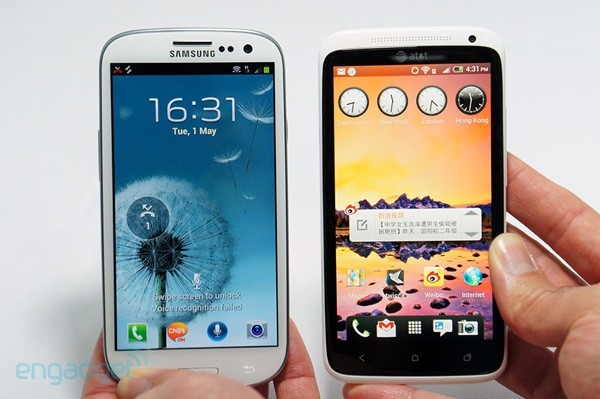 Mali GPU's are used in some Samsung phones like some Galaxy SII's and the international Galaxy SIII. Both are great GPU's but the version in the GS3 is especially fast. Do we need quad-core phones? I'm not sure. Right now, other than a few games, I don't know of apps that take advantage of them. Even for gaming my guess is that right now a good dual-core will do just as well for you as a quad. If a quad-core phone uses more power than a dual-core phone when idle I'm not sure I'm a fan. The Tegra 3 has the 5th "Ninja" core to keep power usage low by running off that one core when higher performance isn't needed. I think the Snapdragon S4 quad-core processors can run off any number of cores as needed. I'm not sure what the Exynos Quad used by the International Galaxy S3 does to save power. I would just be careful about jumping to quad-core in a phone and check into the battery life first. There definitely seems to be a benefit to using a dual-core CPU but I'm not sure about a quad. You may be better off until more apps are designed to utilize quad-core processors. Then again, who knows, maybe I'll buy one faster than I think. At least for now you'll probably find more value in a dual-core processor with a fast GPU then a quad-core processor alone (though they do have fast GPU's as well). The die sizes used to create the CPU and chipset's are getting smaller which means less heat and therefore they use less power to do the same work. Other design optimizations can let the processor get more done faster as well, increasing battery life. The smaller die sizes also mean the processors could be run at higher clock speeds. The main idea here is expect better battery life as well as more speed with newer CPU's. Just to let you know where current CPU's are at as far as die size goes the TI OMAP processors in phones like the Droid Razr and Galaxy Nexus use a 45nm die size. The Qualcomm Snapdragon S3 in the HTC Rezound and the LG Optimus LTE also uses a 45nm die size. The NVidia Tegra 2 and Tegra 3 processors have a slightly improved 40nm die size. The Samsung Exynos Quad (in the international version of the Galaxy S3) uses a 32nm die size. The Snapdragon S4 processors, with the exception of two low-end "Play" models that I don't think are in any phones at this time, use a 28nm die size. There are other factors about the design such as caches but one factor that makes a big difference is the ARM Cortex-A architecture. The current TI OMAP processors in the many phones like the Razr and the Galaxy Nexus use a Cortex-A9 architecture. The Samsung Exynos Quad in the international version of the Galaxy S3 uses the same Cortex-A9 architecture as does the Tegra 2 and Tegra 3. So do phones with the Snapdragon S3 CPU. There is a newer Cortex-A15 design that is faster but not being used in any released phones so far. Qualcomm developed a new design based on Cortex-A15 called Krait. While Krait may not have all the advantages that Cortex-A15 will it definitely is much faster per-clock cycle then Cortex-A9 cores. This is at least one reason why it's not uncommon for a dual-core Snapdraon S4 to beat a quad-core Tegra 3 processor in benchmarks. The Tegra 2 and Tegra 3 also have a disadvantage to some other current processors of using single channel memory as opposed to dual channel memory. The current OMAP's and Snapdragon S4's use dual channel memory which helps with some tasks. OMAP, Tegra 3, and Snapdragon S4, also support NEON which Tegra 2 does not. NEON is an extension that can give a significant performance boost for some calculations. One additional note I'd like to add, make sure you consider what you will be using your phone for. Let's say you have the option of getting any processor type and while you're not excited about quad-core or you like the idea of a 28nm die size you plan to mostly play games. There are a number of games available that are optimized for the Tegra 2 and Tegra 3. Some games are only available for those processors or only have certain features enabled on those processors. For that reason, the Tegra 3 may be your best bet. I'm not saying that the Snapdragon S4 is not good for gaming, it's excellent for gaming. I'm just saying that some games may actually require a Tegra or play better on the Tegra just because that's how they were made. There are a number of display types available now. LCD, SuperLCD, SuperLCD 2, IPS, IPS+, PLS, Nova, AMOLED, Super AMOLED, SuperAMOLED Advanced, SuperAMOLED Plus, and Pentile are some of the different technologies out there. I'm not going to go over everything but I'm going to go over some basics. There are two choices, LCD and OLED. OLED, or Organic LED was supposed to be this incredible new technology that was better than LCD because it only needed power to light the pixels which were in use, which is any that are not black. An advantage of OLED is they let devices be thinner since no back light is needed. This is because each pixel produces its own light. Also, since each pixel in independently lit OLED displays can display true black and crazy high contrast ratios that LCD's can't. The problem is for most a lot of common uses the screen is not mostly black. For a lot of things like reading text or browsing web pages the screen is often mostly white - which takes the most power for an OLED to display. So OLED displays typically take more power than LCD's. They've improved OLED a ton since it was introduced. Now they're all Active Matrix OLED displays and they've made improvements to use less power. LCD is the same Liquid Crystal Display that's been used on laptops for years. They're all Active Matrix as Passive Matrix LCD's went away a long time ago. You will hear about IPS, IPS+, PLS, SuperLCD 2, and Nova versions of LCD. These are different technologies that increase LCD brightness and reduce power consumption. They may also help color accuracy or contrast ratio. As far as I can tell they all give excellent results. I'd have a hard time saying which one is better. I don't know exactly what SuperLCD or SuperLCD 2 are but they seem to be just as bright vibrant looking as the other technologies. Of course IPS+ should be better than IPS and SuperLCD 2 should be better than SuperLCD. I think IPS+ uses less power than IPS for the same brightness. PenTile is a technology developed by Samsung based on how the human eye works. PenTile displays can be OLED or LCD. It uses a different sub-pixel matrix where not every pixel has red, green, and blue elements. Basically, it's made to save money and maybe give a little better battery life without hurting the display in a noticeable way. The best implementation of PenTile I've seen is on the Samsung Galaxy S3. So while a non-PenTile display is desirable most people will not notice a difference most of the time. Especially with screen resolutions getting so high on such small screens, producing a high PPI, it really matters less and less. So while not having PenTile is a plus having it probably will not bother you and it may almost be required to get good battery life with an OLED display. They've gotten much better but I think OLED is still a battery hog for screen that display mostly bright colors or white. No matter what phone you get you can often significantly increase your battery life (screen on time) by reducing your brightness. You don't need to make it dim but for a lot of uses, especially in doors I've found, you can make the screen much dimmer than the auto setting and still have a great display. First let me get a pet peeve out of the way. RAM is memory. Storage is not memory. Referring to storage as memory is like calling your hard drive RAM. A phone may have 8GB of Storage. It will not have 8GB of RAM, at least not this year I'm aware that it's really "Flash Memory" we're talking about when we talk about "Storage" in a phone, but calling it "memory" helps nothing and can confuse things. Friend's don't let friends refer to "storage" as "memory"
Nearly all new Android phones and tablets these days have 1GB of RAM. Some new phones, the first being the Samsung Galaxy S3, come with 2GB of RAM. Two questions people have are does the extra RAM hurt battery life and is it needed. No, RAM does not hurt battery life. Yes, technically it takes a little more power to keep the data "alive" in 2GB of RAM than 1GB of RAM but it's a very small amount of power. Also, you'll save some power with more RAM because the OS shouldn't need to go back to flash storage as often and accessing flash storage is more of a power drain than accessing RAM. Whether or not the extra 1GB is needed is a harder question. What I can say is over the years a lack of RAM has caused more devices not to get Android OS upgrades than any other hardware deficiency. For that reason along I would kind of like 2GB of RAM in my next phone. The reality is many new devices are still coming with 1GB of RAM, even ones that run Jelly Bean. I think you'll be OK for a while with 1GB on your phone but I don't know if I'd promise you'll be able to run Android 5.0. Of course I'm also assuming that your OEM and wireless carrier will support your phone well. That can often have more to do with you getting an update than the hardware in your phone. On the plus side Android has matured a lot over the years and 4.1 is much more refined than 2.3 for instance. So at least if you're stuck on 4.1 your stuck on a much more refined platform than you would have been even a year ago. Built-in storage on a new high-end phone will probably be either 16GB, 32GB, or maybe 64GB. Keep in mind that this amount given doesn't take into account things like formatting and the room taken by the operating system and pre-installed applications. If it comes with 16GB of built-in storage expect to have something like 12GB usable but this will vary by device. Many, but not all, devices have a MicroSD slot to add storage. MicroSDHC will take up to 32GB cards. MicroSDXC will take up to a theoretical limit of 2TB. If something just says "MicroSD" the writer is just not being specific. No new device has a MicroSD slot. That was the original standard for a storage card of that size and could only go up to 2GB. Most devices released over the last year seem to have MicroSDXC slots but you may want to confirm if you're planning to buy a card larger than 32GB for a device you have. If it takes a 64GB card it's MicroSDXC. Tomorrow Motorola and Intel are expected to announce the first Intel based Android phone. Based on some leaks the benchmarks from the Intel processor look very impressive, even with just one core. It may be that Intel will come out with a great performer that has excellent battery life but I would say proceed with caution of you're considering and Intel processor in your next Android phone. Intel doesn't have the experience with the high performance and low power consumption that we're coming to expect with all the new S4 processors out there. Even worse, an Intel Atom was used in the Cisco Cius Android tablet. Do some searching and you'll see it had compatibility issues and other problems that kept it from being adopted. The compatibility issues were due to the fact that it wasn't an ARM based core. It was an X86 based core. Android apps just are not made and/or optimized for x86 processors. Thanks to Java isolating apps from the hardware many or most apps would probably work but nothing was optimized for it and something probably just didn't run well. I'm giving this warning because many seem to be excited just because Intel has great desktop processors. Don't expect them to come out on top at the start and do some research before you buy a phone with an Intel processor. Make sure apps you want to use will work on it. If you're planning to use it for gaming make sure the games you like run well on it. Intel may well have fixed their issues but I just want you to be aware that while this is not their first time making mobile processors (I had Windows Mobile devices that used them) it's their first time making them for an Android phone that I'm aware of. We already have evidence that even with Intel's latest generation of processors there will be compatibility issues. Near Field Communication is a technology that allows communication between devices that are in close proximity to each other. The idea was that it could be used for mobile payments but the idea has been a little slow to catch on. I was actually surprised to learn the other day that there are a number of places where in my area of Pennsylvania where you can use this. Apparently PayPass works with Google Wallet and may be used anywhere that takes PayPass, like McDonald's and Sheetz for instance. Besides mobile payment it can be used with tools like Android Beam, included with Android 4.0, Ice Cream Sandwich, to transfer things like contacts, web URL's, and video to another device near you. Part of the reason NFC hasn't become very popular would be the fact that until recently most devices didn't include it. Now the Nexus 7, Galaxy S3, and Droid Razr M all come with it. Be careful though, Verizon will not let you use Google Wallet so that may limit some of your functionality until Verizon has their payment service up and running.